The number of dairy farms in Vermont continues to shift. The official count of dairy farms has fallen by 7 to 977 since the year began. Spring is a time when struggling farmers make the difficult decision whether to plant crops or put their cows up for auction, and a few are taking that step. "I guess we’re ready to go, can’t wait to sell them they’re such a nice herd…start with lot 285, fresh first calf heifer. Starts at 1,500," calls auctioneer Reg Lussier. When farmers want to sell their cows, Northeast Kingdom Sales is one of the companies they call. Ringman Jon Lussier said it’s been a busy month for the auctioneers, "The price of milk is going down. The forecast doesn’t look good. And even though the price of milk is still around $16-17 it’s almost as bad as when it was down at $11 because everything else is so high, fuel and fertilizer’s so high right now." Lussier says many farmers took out lines of credit to weather the low milk prices of 2009, and they’re either unwilling or unable to borrow another time as milk prices drop again. This family farm in Franklin milked 70 jersey cows, without a modern milking parlor, and Lussier says that’s typical of the farms that are selling their cows. So a few dozen bidders and spectators gathered on a sunny morning to see the cows off to new farms. "7 and a quarter, to number 29, going to Maine," calls Reg Lussier. 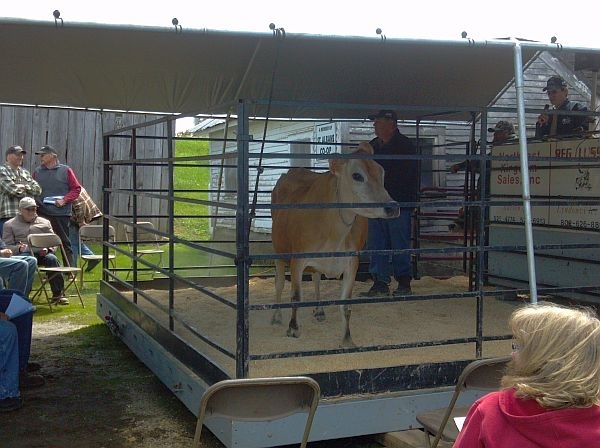 Buyer 29 from Maine bought 11 cows to increase his 50-cow jersey herd. Jon Lussier says cows are heading to other states, including New York, but the demand for cows is still strong in Vermont, though some won’t be milked. "There’s still a bit of demand for cows and the price of beef is so high. So that provides a good floor for a herd that helps cull cows, the demand for beef. Anything that has a blemish on them that’s not bred just right, older cows, there’s a good market for them as cull cows," Lussier said. Standing outside the sale tent, Shane Hoague of Barton says it’s a shame to see another small farm go out. "There’s no funding available for anyone that has a 50 cow dairy farm or smaller," Hoague said. Hoague and his wife made the decision to sell their small herd last fall, after trying unsuccessfully to start a small, diversified farm. Hoague says cows and agricultural fields aren’t disappearing, they’re just becoming part of larger farms. And that’s true for farmers, too. Hoague now works for a 300-cow farm, which he says is still in competition with the larger farms in the area. "Land competition, the competitive land around here is unreal. If you’ve got an acre and a half of land, these guys want it. A lot of guys in this area are branching out, willing to go further for the feed," Hoague said. Deputy Agriculture Secretary Diane Bothfeld says that the average dairy herd size has grown to 135 cows, and the fluctuating number of farms doesn’t give a full picture of dairy in Vermont. "The farm size on average is increasing. The milk production remains the same. And the number of acres farmed has been pretty steady. but that’s all acres, not just dairy farms. So we still have about the same number of acres in farming, just fewer active cow dairy farms," Bothfeld said. And Bothfeld hopes that as the owners of small farms without a lot of hired hands look to retire they consider that there are still many young farmers who would love to get into the business. And she says since January, a few farms have started milking cows.